Earlier this year, Vermont Public Radio ran a story about speed limits. It cited three small towns whose municipal budgets are funded largely by speeding fines imposed on unsuspecting motorists. Town officials, quoted in the piece claimed the slow zones are justified for safety reasons. Others saw them as artificially low and unfair to drivers. The story captured opposing attitudes about speed that tend to vary depending on whether one happens to be sitting behind the wheel or standing beside the road. As we switch from driver to pedestrian and back again, our perspective and desires change. No wonder that the setting and enforcing of speed limits can be complicated and divisive. But while VPR listeners were asked to consider both sides of the speed trap issue, a larger question went unanswered—where exactly, should we slow down and where is it okay to drive fast? It used to be clear. Before sprawl blurred the edges between town and country, the built environment offered sharply different driving contexts—the open road where speed made sense, and the village, where it didn’t. Between villages, highways were mostly free of slowing and turning cars, intersections, pedestrians, and driveways. Most of those hazards were safely tucked into village centers where the pattern of land forms and buildings sent drivers clear signals to slow down. 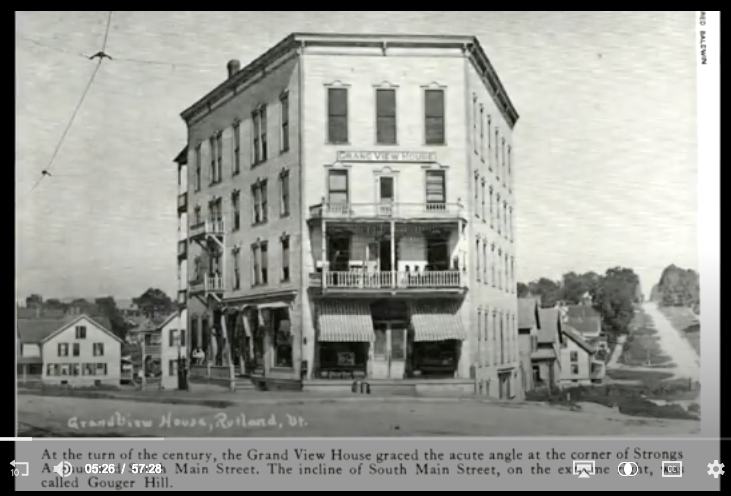 The curve or hill that marked the entrances to most towns forced drivers to decelerate and inch past closely-spaced buildings on Main Street, snaking though narrow streets before reaching open land on the opposite end of town. A sign might mark the lower village speed limit, but a narrow bridge or a barn looming over a bend in the road communicated the need to decelerate far more effectively. Route 7 between Dorset and Wallingford has several stretches where 50 mph makes perfect sense. This type of roadway—free of curb cuts and turning vehicles—becomes more rare when towns zone land along highways for commercial uses. A bend in the road, buildings that hug the street—clues that it’s time to slow down. Public buildings embrace the road that passes through Lincoln. Their message: pause and look. The drive through Plainfield requires slipping between buildings, turning, dipping and rising. A sign warns drivers that they must slow down. But the curving descent to a stream crossing is far more effective at slowing traffic. It’s less obvious now. Main Streets look and feel more like highways, and rural roads function as business corridors. Village activities have faded, or migrated to the countryside. Homes are scattered beyond a frayed edge. The curves, twists, narrow bridges, and many of the buildings that once formed village gateways have fallen victim to federal and state road standards requiring wider, straighter, more open roads. Taking out the Kinks. A bridge replacement project will realign a road in Morristown, taking away some of its curve to meet current road design standards. When the places you need to go every day are far apart—the byproduct of our dispersed land use pattern—speed seems essential. 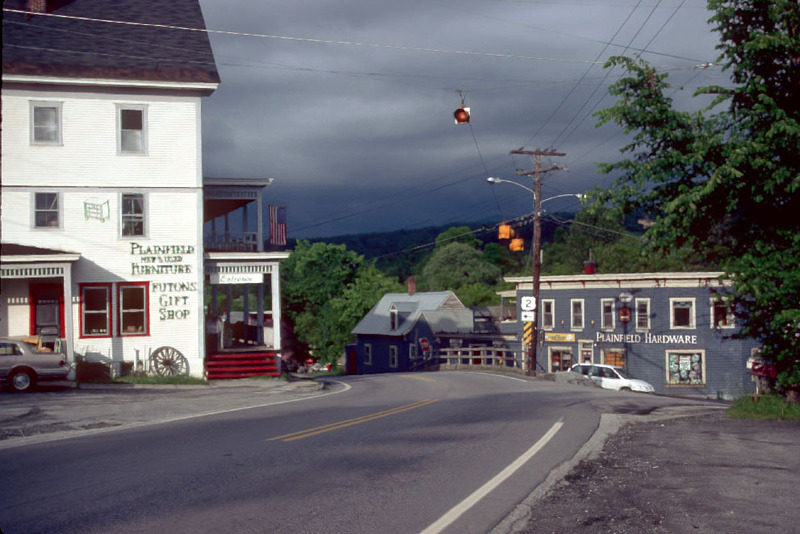 But Vermont’s built environment isn’t suited to the speed we crave and our modern cars offer. Except for two interstates and a handful of bypasses, most roads are intertwined with our settlements. They wind through villages, nudge up against homes and bisect farms. A lot of people live, work or walk very close to major thoroughfares. It’s an intimate relationship that makes for gorgeous scenery, but creates conflict between our desire for speed and our need for safety. The Agency of Transportation (VTrans) has attempted to satisfy both needs by untangling that relationship—creating a smoother path for moving vehicles and greater distance from the communities they bisect. It has spent millions taking some of the kinks out of major highways, so that they function less like two-lane roads and more like interstates. In the forty years I’ve driven from Burlington to Bennington, I’ve seen Route 7 grow wider and straighter. Trees, barns, roadhouses, and tourist shops that once hugged the road, vanished as sections of the right-of-way expanded to create wider shoulders and more passing lanes. All the straightening and widening makes it hard to obey speed limits because posted speeds often contradict what the road tells us to do. This is the case on Route 7 in Mt Tabor, one of the towns cited by VPR. Its tiny hamlet is no more than a handful of buildings around a splayed intersection. Instead of visual clues compelling them to slow, passing motorists see a flat, straight road with wide shoulders. In fact, in 1999, when the Selectboard Chair petitioned to have the speed limit reduced from 50 mph to 45, highway engineers revealed that the road had been designed to handle speeds of 60 mph. In posting a limit 15 mph below the speed that most law-abiding drivers perceive to be safe, Mt. Tabor had created the perfect speed trap. When entering Mt. Tabor, it’s easy to miss the signs when you’re seeing the flat, straight, wide road ahead of you. The inside of Mt. Tabor doesn’t look much different than the outside. Slowing requires a conscious act, because the road design doesn’t eilicit an intuitive one. But who can blame the town for monetizing the “upgrade” they received from VTrans years ago? 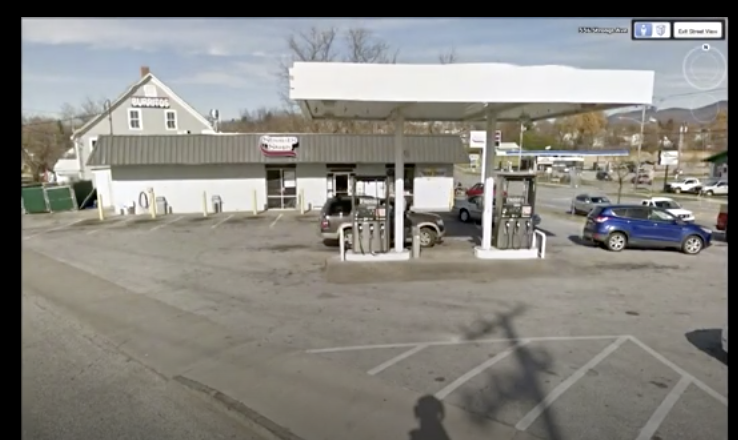 A design speed of 60 mph in that location may be safe for drivers, but it could prove deadly for walkers and dangerous for locals pulling onto a road that is essentially their main street. Town officials are justified in demanding a safe environment for the pedestrians and slow-poke drivers in its town center, however few they may be. In its guidebook, Setting Speed Limits, The Vermont Local Roads Program offers advice to municipalities on regulating speeds. In addition to considering a road’s context—type of development and density—it suggests monitoring traffic and identifying the speed that at least 85% of vehicles are traveling. An ideal speed would be at or slightly below this number. Too far below and drivers will become frustrated, or scofflaws. This method acknowledges that most people will drive the speed they perceive to be safe. relying less on posted signs and more on the look and feel of the roadway. But the 85% rule of thumb often gets ignored. When exurban residents, scattered along country roads demand the benefits of living in a slow speed zone, limits are set below what most drivers would perceive to be safe. Jericho is a bedroom community with homes spread thinly across fields and woods. Despite the town’s low density, all but a few segments of its roads are posted 35 mph. This undoubtedly pleases many residents, but it’s frustrating to drive through that town, creeping along for seven miles at what appears an arbitrarily low speed while a line of cars stack up behind you. In fact, Setting Speed Limits warns against setting a uniform speed for all roads. Limits that are perceived to be unreasonable erodes citizens’ respect for the law and can cause risky behavior like dangerous passing. Land beside the open road that will soon become someone’s neighborhood. The messages are mixed. The road tells us to speed up, while the signs say we must slow down. It has become easier to zip through villages than past country homes. Land use regulations that encourage sprawl and engineering standards that allow speed have built expectations for traveling quickly between far flung locations. But few people want to live with the reality of speeding traffic, so we argue about speeding tickets. Building the next generation of homes and businesses, close together, in downtowns and villages is the only way to make speed a lot less necessary. A few weeks ago, Burlington, VT residents said yes to a more dense downtown and with it, a more sustainable transportation future. After a heated public debate, voters approved the zoning change and funding mechanism that would allow a large, mixed-use redevelopment project—the Burlington Town Center—to move forward to the next stage of development. If built, the city can expect many benefits from this intensive reconstruction of a key downtown parcel, including jobs, affordable homes, increased tax revenue, better storm water management, and the possibility of capturing waste heat in a distributed energy district. Saying yes to ground floor retail with upstairs offices and many floors of housing, will also lay the groundwork for a cleaner, greener transportation system. It will make downtown easier and more pleasant to walk in, provide many more destinations to walk to, and put a significant number of people close to where they need to go every day. Transportation researchers have identified several elements of urban form that lower vehicle miles traveled, effectively reducing energy consumption, air pollution and carbon emissions. The BTC plan could serve as a poster child of how those elements can be combined in one sustainable transportation package. It is dense. It blends a healthy mix of uses within floors. It sits beside a transit hub. It is ringed with services and lies smack in the middle of a regional job center. These are some of the features that offer people real transportation alternatives and lessen their need to drive, or even to own a car. The project’s design helps too. For the first time in 40 years, pedestrians and bicyclists will be able to move freely across the downtown. The 1970s shopping mall that had severed two key north-south corridors, will be demolished, restoring public rights-of-way and the historic pre-urban renewal street grid. One measure of walkability is the number of intersections in a given area. The BTC plan will add four new intersections, offering people more choices and direct routes to their destinations. It will also turn the mall inside out, moving stores from the interior of the building to the exterior, along public streets, where they will enliven the streetscape with entrances, display windows, and more people coming and going. Perhaps the biggest drawback in many voters’ minds was the scale of the proposed buildings, which will rise an additional four stories above the previous downtown height limit. But in terms of transportation benefits, the scale of BTC and its height are, in fact, its best feature. The project will create 274 new homes, each offering the ability to arrive at a downtown job, shop, restaurant or school, not by car, but in an elevator. Restricting the buildings’ heights to ten stories would mean eliminating usable space in a very strategic location, including over 50 apartments that are planned for the top four floors. At 14 stories, 50 additional households can rely more on walking, biking, buses and car share, and less on private vehicles to get to where they need to go. What would make it more sustainable? Reducing the number of parking spaces to the barest minimum. Restricting the supply of parking has proven to lower vehicle miles traveled. This can be accomplished by sharing spaces—mixing tenants who need parking at different times of the day and night, incentivizing commercial tenants to create parking demand management programs, and unbundling the cost of parking from residential leases. Giving tenants the option of not paying for a parking space, in a location where they have other travel options, will give them an added incentive to live car free. As it moves through the City’s development review process, the BTC design will be refined, with careful attention to how the building facade affects the surrounding streetscapes. But the land use essentials of sustainable transportation—density, connectivity, diversity of uses, location efficiency, and access to transit—are in place. When it is complete, many more Vermonters can significantly reduce the environmental impacts of their travel while enjoying the pleasures of an urban lifestyle. 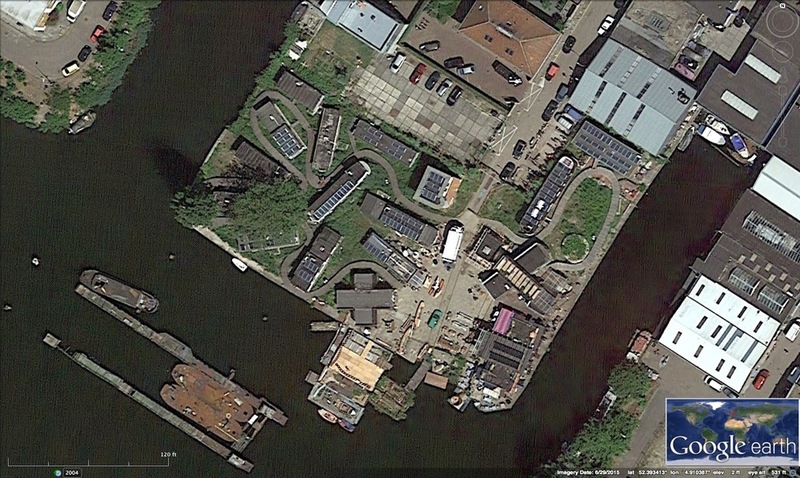 In 2010, the City of Amsterdam hosted a design competition and offered up a defunct, polluted shipyard on its industrial north side. The winners would have free use of the Ceuvel waterfront parcel for ten years. Enter the design firm space&matter and a group of environmentally motivated artists who were looking for studio space. Their winning proposal was to build a public park by hand, from recycled materials, using low-cost techniques to clean the contaminated soils. They would bring people together to learn about urban sustainability. Six years later, many of Park Ceuvel's components are complete. 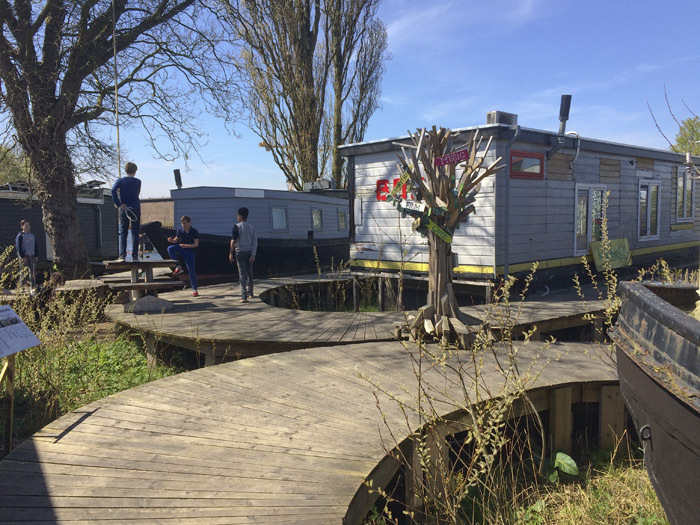 Events take place in a dozen discarded houseboats that were floated to the site, hoisted on shore and re-purposed for studio, workshop and classroom space. Plants that draw contaminants from the soil poke up around a connecting boardwalk. De Ceuvel has none of the tidy charm of central Amsterdam. It feels less like your aunt's sitting room than your handy but eccentric neighbor's back yard, if he also happened to collect rusty barges and the hulls of rowboats. Spare tires, cast-off crates and plastic drums serve as vessels for garden beds. Cafe customers step around wheel barrows and power tools to get to outdoor tables. But messiness is the point. Everything is made from something that used to be something else and that transformation is made visible. It's not supposed to be finished. Until the ten years is up, it will remain a work in progress. On the warm spring day I visited Ceuvel, a middle school class had scattered into every corner of the park and were experiencing the place in the messy, hands-on way it was designed. They explored, swung, floated and played for the better part of two hours, then reluctantly gathered their bikes and headed back to school. On a recent trip to Copenhagen, a day trip across the Øresund Sound led me to the western shore of Malmö, Sweden, and the brand new district of Västra Hamnen (Western Harbor). Built on a former shipyard within walking distance of the city center, Västra Hamnen seems to get everything right. It features state of the art environmental performance--net-zero buildings, 100% local renewable energy, biogas from waste, public transit, pedestrian and bike-friendly design, green infrastructure—all wrapped up in a gorgeous architectural package. Strolling through the intimate spaces of the recently completed Bo01 neighborhood, it's hard not to imagine yourself living the good life in this green seaside community See the emerging Västra Hamnen district and the completed Bo01 neighborhood in Google Map view and check out my photos, taken on a gray Saturday morning in April. Higher buildings line the waterfront, offering ocean views and blocking winds from reaching the neighborhood's interior courtyards. Five-story apartment buildings line the larger public spaces leading to the waterfront. Cars are welcome as slow-moving guests in pedestrian and bike-friendly territory. A view from the main plaza into the interior of the neighborhood, where lower buildings create a more intimate scale. 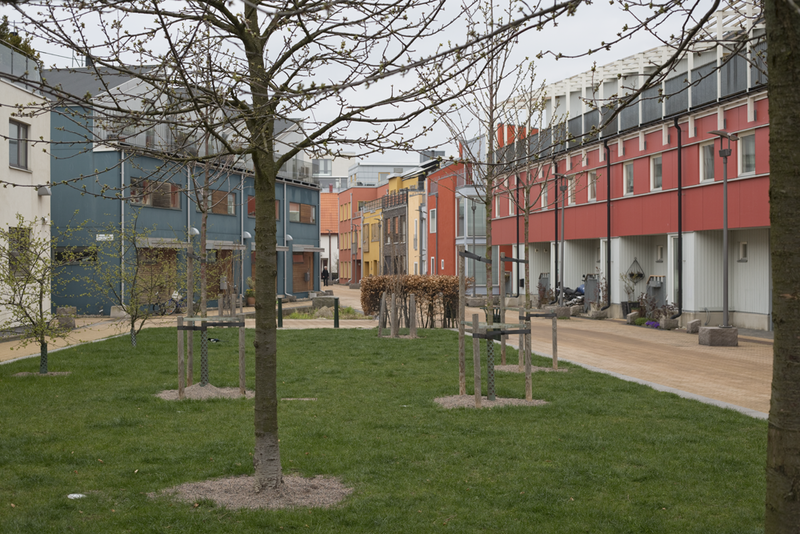 Malmo's wet climate is celebrated in the landscape design of Vastra Hamnen. During rainstorms, water is collected from roofs into street side runnels. Moving water is channelled into central gardens where it soaks slowly back into the earth. 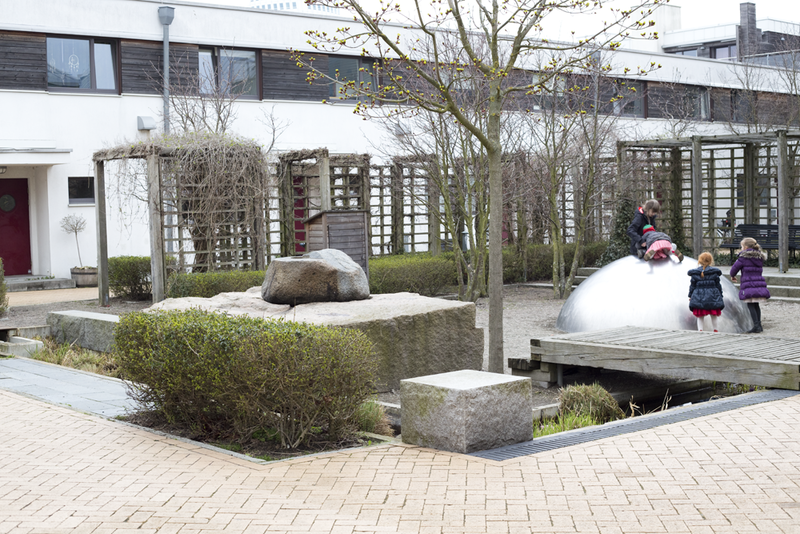 A central play area with rain garden. Town houses along an interior lane. Upscale buildings sit side-by-side with more modest structures, providing a range of housing affordability. Narrow streets widen in places to form neighborhood greens. Many buildings wrap around semi-public courtyards. Upstairs balconies offer semi-private outdoor space for make up for the lack of front yard on narrow streets. Just beyond the narrow lanes and small courtyards sits a larger green space. The spaces that wind between buildings serve as street, sidewalk, bike way, playground, front yard and at this corner, basketball court. Lanes narrow at the edges, offering glimpses into the neighborhood from the more public waterfront promenade. What can you buy within a 10-minute walk of your home? If you’re lucky, there’s a store down the street. And if you’re very lucky, that store stocks real food and useful items like bread, apples, carrots, dish soap, and toilet paper. According to a recent Walkscore analysis, Philadelphians are 11 times luckier in this respect than residents of Oklahoma City. Almost 2/3 of them live close to a food store. Only 5% in Oklahoma City enjoy that convenience. The percentage is equally low in Albuquerque, Indianapolis, Tucson, Charlotte and countless suburbs. But in early-mid 20th century, residents of most American cities could find many of life’s necessities on the nearest street corner. 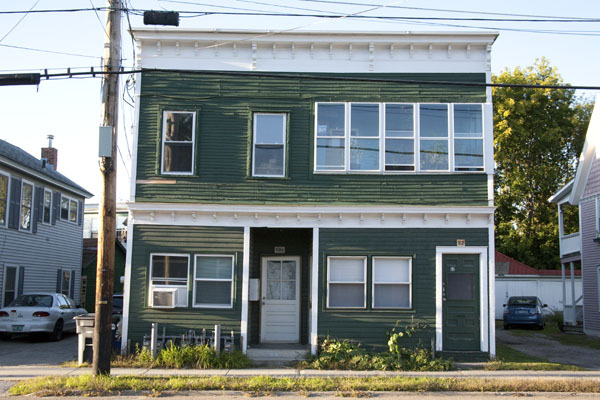 This was certainly the case in Burlington, VT, where groceries, hardware stores, creameries and other businesses sprouted on the ground floors of houses on streets where high foot traffic created a steady market for small scale retail. Many stores could be found in the city’s Old North End, a densely populated home to generations of immigrants. Selling goods and services to one’s neighbors through a home-based business offered one pathway to prosperity for recent arrivals. In 1948, 85 food stores were located in an area of roughly 5 square miles. But as the century unfolded, the market for small retail tapered off in Burlington, as in most other U.S. cities. Groceries and other stores consolidated and followed their customers to the suburbs. Essentials like meat, dairy, produce and staples disappeared. Beer, soda, candy, and chips appeared on the shelves of local gas stations. 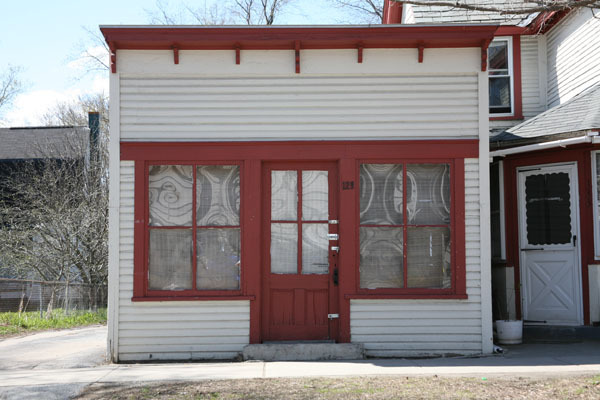 As the market for retail space receded, store owners sold to landlords and homeowners, transferring many of those early storefronts to residential use. Retail has changed profoundly in the last 50 years. In Burlington, some of the small stores had vanished by the end of the Depression, others grew into IGAs (Independent Grocers’ Association) and persisted until they were put out of business or bought by regional chains like A&P (Atlantic and Pacific Tea Company) and later Grand Union, which eventually fell to Price Chopper, Hannaford’s and other more recent superstores. Each consolidation placed groceries and everyday supplies a step further away from the old neighborhood. By 1986, 25 neighborhood groceries remained, and now, nine corner stores serve a developed area three times its 1948 size. In an era when the butcher and the baker are as rare as the candlestick maker, the remaining corner stores may seem like a quaint echo of history. A few of the older stores remain in Burlington’s Old North End. And recent waves of immigrants have breathed life into the district’s commercial street, offering an eclectic array of goods like halal meats, curry pastes, banh mi, queso fresco, and ginger beer in small locally-owned stores. These small businesses offer familiar staples and other everyday items to recent arrivals who, like earlier residents, live close together and don’t own cars. Large chains offer greater efficiencies and lower prices, which is why residents of urban neighborhoods go out of their way to shop in them. But if the full service supermarkets are out by the interstate, requiring people to go an inconvenient distance, it helps to have plenty of mom and pop stores scattered throughout the neighborhood. Retail diversity makes life easier for people who don’t have a car, or don’t want to drive. Walkable, sustainable, and vibrant cities have neighborhoods where groceries and household items are as common as chips and soda. If you’re a person of a certain age you may remember the “Sunday drive.” Not to be confused with driving on Sunday, the Sunday drive meant climbing into the car with your family, for no particular purpose other than to get out of town, take in the scenery, and enjoy the pleasure of moving. Although it may not top of your list of leisure activities this summer, in mid-century America, the Sunday drive was as common as wearing hats and smoking in public places. The custom of riding out on a Sunday, long a privilege of the wealthy, became widespread in the 1920s, when mass production of automobiles put cars in the hands of the middle class. Between 1917 and 1923, 15 million Model Ts, rolled off Ford’s assembly line and became a common sight along country roads, packed with families in their Sunday best. Sunday driving remained popular for decades and faded out in the 1970s. Conventional wisdom blames its demise on the gas shortages of that decade, but I’m inclined to believe leisure driving was the victim of a changing built environment. Now, they are officially known as “passenger vehicles,”—a more accurate term, since most of the pleasure has drained out of the experience of driving. After a week of sitting behind the wheel, idling and turning, dropping off and picking up, 21st century Americans might find it difficult to imagine loading the family into the car on a Sunday afternoon and heading out for a drive just for the fun of it. 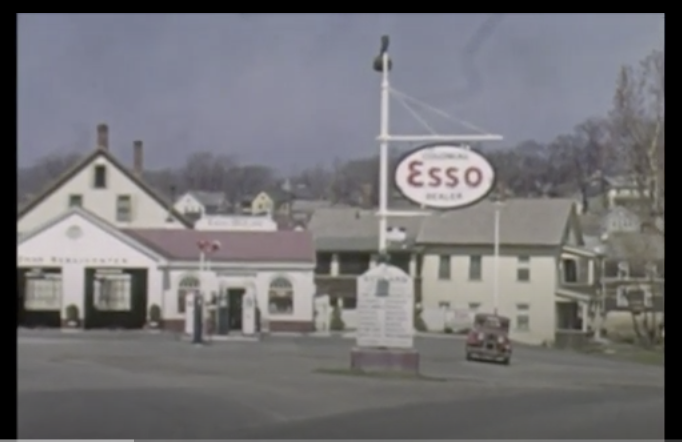 Growing up in a small New England city in the 1960s, my parents owned two cars. 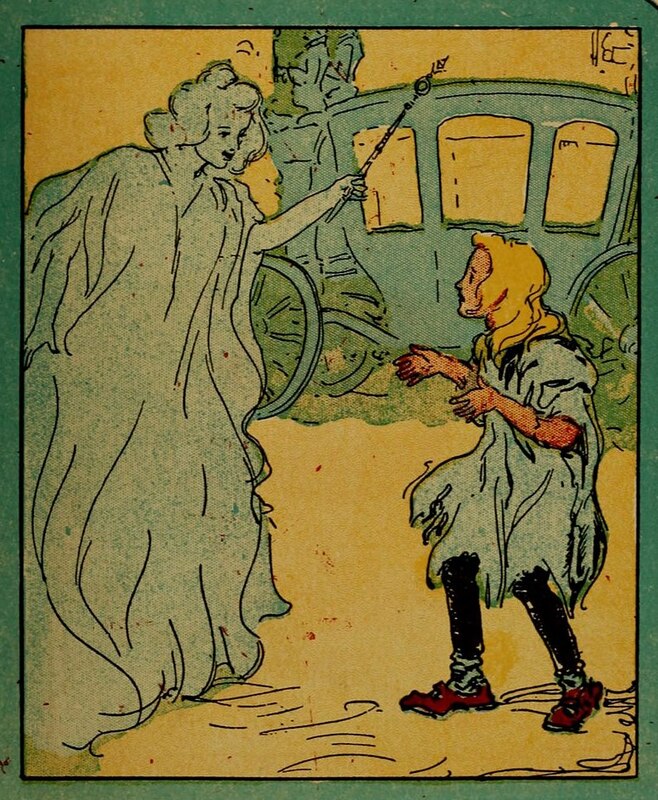 My mother used hers for shopping and other errands, which almost never involved chauffeuring children. So it was a thrill, after a week of walking between school, home and downtown, to pile into the back of the station wagon with my brothers and sisters. Sunday drives usually held the promise of an ice cream stop, but the real draw was speed, and the opportunity to see something completely different—to cruise under a forest canopy or roll past fields, moving through places that seemed exotic, yet were not more than a few miles from our home, just beyond the edge of town. That edge is long gone, blurred by decades of sprawl. The city I grew up in, like most in America, has thinned out, spilling its contents into the surrounding farmland. The destinations we used to walk to now line the roads we cruised along. Elementary schools, department stores, movie theaters emptied out, many cleared away for parking lots. What lay beyond town now is not very different from what’s left inside. 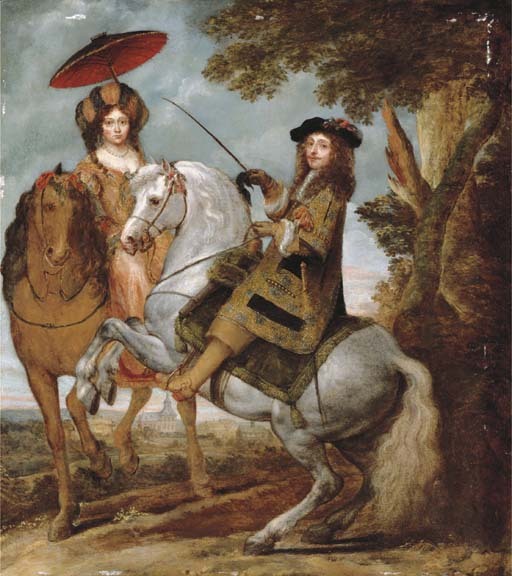 The Sunday Drive experience relied on the novelty of riding together, but it also drew its appeal from the contrast between urban and rural, between the inside of cities and their outskirts. It may seem strange for an environmentalist to champion leisure driving, but I say bring back the Sunday drive. Let’s make driving the inessential, fun and occasional practice it once was by restoring density and walkability to our cities and towns. This may not be as far off as it seems. Walking down a street in Portland’s Pearl District a few years ago, l noticed a rather snappy and completely impractical Zip Car. Not designed for the typical urban car share run to Ikea or Target, the only thing this vehicle was good for was to get out of town and cruise. I'm not sure whether sports car convertibles are common in the Zip Car fleet, but I would consider them an indicator of a healthy urban environment like the Pearl District, where average vehicle miles traveled per month tops out at 727, compared to 2,000-3,000 for the typical American suburb (Source: Cool Climate Network.) The Pearl District, and adjacent downtown Portland connected by streetcar, have almost everything residents need, including two full service supermarkets. The only thing not within easy reach of the Pearl, are vast tracts of open land—an entirely different and inviting world to cruise through on an occasional Sunday afternoon. What kind of cyclist are you? If you don’t mind muscling onto arterials and pedaling along with traffic, The Portland (OR) Bureau of Transportation has a name for you–“strong and fearless.” You do not require dedicated space on the street, and will not be deterred by swerving cars. You are the cycling elite, making up less than 1% of the population that feels fine riding on any urban street. But it’s far more likely that you are not so bold, that you are among the “interested and concerned.” You like the idea of cycling but rarely bike for transportation because it seems downright foolhardy. Portland has one of the highest bike-to-work rates of any U.S. city, but given the low ridership rates in this country, that’s not saying much. Despite decades of investments in bike infrastructure on city streets and transit facilities, the number of bike commuters in Portland appears stuck at six percent, where it has lingered for the last four years. This is well short of the city’s official goal—25% of all daily trips made by bicycle. The lack of progress led the city’s transportation bureau to conduct research on how Portlanders feel about biking and why they aren’t doing more of it. After surveying residents, it developed its own typology of bicyclists. The Portlanders who are “enthused and confident” don’t mind riding in traffic, although they prefer to be in a dedicated lane. This 7%, along with the fearless 1%, bump the number of cyclists above the national average, creating a visible presence on the streets and lending the city its reputation as a biking mecca. Beyond that small pool however, Portland’s reputation as a bike-friendly city has not convinced the vast majority to hit the streets. In surveys a full third of the population say “no way, no how” to cycling. They may have no interest, aren’t physically able, or don’t know how to ride a bike. The rest (60%) are “interested but concerned.” They are curious about cycling and would like to give it a try but don’t ride regularly because they consider it too dangerous. In other words, the bike lanes the city has been installing for years do not offer them a sufficient sense of protection. They feel too exposed to moving traffic. This fact—that many people want to bike but need a safer environment—reveals the key to reaching Portland’s biking goal and offers any city striving for a more sustainable transportation system a clear direction. The vast majority of people who don’t feel strong, fearless, enthusiastic and confident on a bike need more than the disjointed system of painted lanes and sharrows that pass for bike infrastructure in U.S. cities. To increase their confidence and reduce the likelihood of a collision, they need more room on the street, and a space that is separated from moving vehicles. Unlike standard bike lanes, cycle tracks provide a level of protection that would allay the fear of would be cyclists. Portland State University researcher Jennifer Dill dug a little deeper into the four categories of cyclists and found that protecting bike lanes would go a long way toward convincing “the interested and concerned” to get around on a bicycle. 43% said they would feel comfortable riding in a separated lane, compared to 2% who would feel safe in a standard bike lane. Source: "Categorizing Cyclists: What Do We Know? Insights from Portland, OR"
Cities with protected bike lanes have a higher percentage of people commuting by bike. In her excellent article, The Rise of the North American Protected Bike Lane, Angie Schmidt detailed the growing support for cycle tracks, and why cities that are serious about biking have been installing them along key routes. A recent study of San Francisco Bay area communities showed most towns’ bike commute rates topping out at 6%, except for Davis, CA, where almost 20% of residents get to work by bike. It’s a university town, which undoubtedly helps, but Davis boasts a system of protected lanes and paths extend well beyond the UC-Davis campus. Not all city streets require cycle tracks. Less heavily traveled roads are just fine with painted lanes. Quiet residential streets with speeds under 20 mph need no interventions to be comfortable for cyclists. But if biking is to become a viable form of transportation, we need to create protected space along arterials and commercial corridors. The 1% who consider themselves strong and fearless enough to ride on any city street in Portland echoes the percentage who currently cycle to work nationally. Getting to work and doing errands on a bike should not be restricted to the brave few. It should be safe and enticing for the rest of us.